Relentless competition requires customer remote services in almost any business. This approach allows companies to make their interaction with clients maximally efficient. On the other hand, the security level of transactions you perform tends to reduce. Thus, it is impossible to make sure that a customer is the person they claim to be. 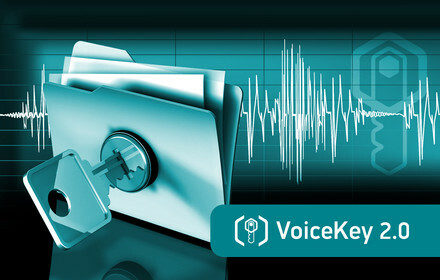 VoiceKey software applies the latest technologies for secured customer verification and personal data protection. It is based on voice biometrics technologies as voice becomes the most reliable way of user verification in terms of remote services. This is the only attribute that cannot be stolen or counterfeited. Existing ways of user verification are based on certain piece of knowledge or information that only user has access to (login, password and other identification details). Nevertheless, this information can be easily stolen or passed on to a third party. VoiceKey resolves this issue by using customer voice as the only way to access within any system. Moreover, voice can be used for efficient fraud prevention among call center clients. As the amount of services provided through call centers is increasing, companies face the necessity to process more and more incoming and outgoing calls. A call center agent has to spend from 20 to 30 seconds on customer verification using traditional methods leading to higher expenditures for processing each call. VoiceKey software enables to perform user verification automatically or in background mode. It decreases the workload on agents and reduces costs for a company. There are several typical solutions based on VoiceKey platform that enable you to perform wide range of tasks for safe user verification. Enables user verification during the conversation with contact center agent. 3 in 1 biometric solution. Integration with the majority of IVR systems. Instantly informs security services about potential threats.